LOS ANGELES-- With the official holiday season in full swing, the time has come to start shopping for loved ones, but what happens if that person is a millionaire who already has the world at their fingertips? 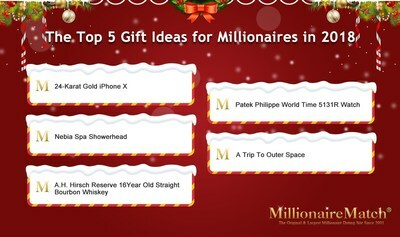 MillionaireMatch, the largest and original millionaire dating site with over 3.5 million singles, surveyed its members and discovered some of the top gift ideas for the holidays, according to PRNewswire on Dec. 5. "No matter the income bracket, it really is the thought that counts," said Katherine, spokesperson for the world's largest millionaire dating site, MillionaireMatch.com. "It's just that sometimes that thought comes with a price tag." Here are the top 5 Christmas gifts of 2018 for millionaires. With the release of Apple's latest generation of iPhone, the iPhone X is already the most expensive smart phone ever offered, but this unlocked 256GB version from Goldgenie, a British company that specializes in customized luxury gifts, is gold-plated in 24-karat gold, and the Apple logo handcrafted in VS1 diamonds. Simply put, this is bliss. From Kickstarter to Silicon Valley bathroom staple, the Nebia Spa Showerhead atomizes water into a fine mist, which delivers water in millions of microdrops, hydrating the skin far better than an ordinary shower and giving the awesome feeling of standing in the mist of a waterfall. A.H. Hirsch Reserve is incredibly rare, much sought after and well known among bourbon enthusiasts. Distilled in 1974 after being commissioned by Adolph Hirsch in a 400-barrel batch and aged for 16 years, it was distilled at what would come to be known as Michter's Distillery. This is a rare, collectible, and downright delicious bottle. Patek Philippe is one of the most prestigious watch manufacturers in the world. Eighty years after the world's first world time wristwatch, the iconic Ref. 5131 received a superb makeover. It's a magnificent piece of art, and is worth the trouble of tracking down this unmatched gem so dear to the brilliant Patek Philippe. "We are happy to receive registrations from individuals who are interested in flying to space with Virgin Galactic." That's the courteous greeting from Virgin Galactic on the application page for all would-be astronauts. Richard Branson's famed SpaceShipTwo will fly passengers fifty miles above the Earth. Travelers will know they've arrived when they begin to experience weightlessness, which will last several minutes. From rare spirits to exclusive experiences, these are the gifts that are sure to delight any millionaire. "Go ahead and forget the gift card and sweater – 'tis the season for pure class and gifts that wow." MillionaireMatch is the first and largest millionaire dating site in the world. It has been featured on CNN, ABC and CBS and was voted "Best of the Web" by Forbes.com. As a result of its outstanding reputation and service, MillionaireMatch now has over 3.8 million quality members.